LONDON--(BUSINESS WIRE)--According to the latest procurement intelligence report from Technavio, the global electronic manufacturing services market is expected to grow at a CAGR of 6.4% over the next five years due to rising industrial automation driving productivity and efficiency in electronics manufacturing. The research report titled ‘Global Electronic Manufacturing Services Market: Procurement Market Intelligence Report 2017-2021’ provides an in-depth analysis of category spend, best procurement practices and cost saving opportunities, aimed at helping organizations achieve superior business performance. The report also provides insights on pricing, supplier positioning, and top companies, enabling sourcing professionals to improve their competitive advantage through procurement excellence. “The global EMS market has evolved into a critical aspect of the electronics and telecommunications manufacturing sector as it provides numerous opportunities for OEMs and electronic manufacturers to improve their demand planning and management and help them proactively respond to changing market conditions,” says lead Technavio procurement specialist Angad Singh for category spend intelligence. “This has also been experienced by its growing contribution in the electronic manufacturing value chain,” adds Angad. Technavio sample reports are free of charge and contain multiple sections of the report including the market size and forecast, drivers, challenges, trends, and more. The adoption of various cost-optimization levers helps buyers of electronic manufacturing services realize direct cost savings and enhance category management and value benefits (including reduced procurement complexities). Many suppliers in the EMS industry have been actively collaborating with 3D printer manufacturers to incorporate 3D printing into R&D and manufacturing processes. The intelligent control tower is another key technology that uses analytics to manage the supply chain on EMA providers. It uses web-based mobile visualization platform along with real-time predictive modeling that facilitates functions such as identifying and understanding end-user requirements, real-time tracking of inventory, risk management, and supply-demand management. Buyers should select suppliers based on their ability to engage in a vertical integration setup, where a single supplier can offer multiple services such as interconnect assemblies and box build. Some of the benefits of vertical integration include the elimination of margin stack up, reduction of supply chain management complexities, and provision of better visibility into individual processes. The bundled pricing model has proved to be cost-effective for buyers as providers reduce their markup for larger client accounts (in terms of client spend on supplier). Suppliers bundle together services such as design and prototyping services and co-innovative R&D solutions based on buyer's requirements. Become a Technavio Insights member and access all three of these reports for a fraction of their original cost. As a Technavio Insights member, you will have immediate access to new reports as they’re published in addition to all 6,000+ existing reports covering segments. This subscription nets you thousands in savings, while staying connected to Technavio’s constant transforming research library, helping you make informed business decisions more efficiently. 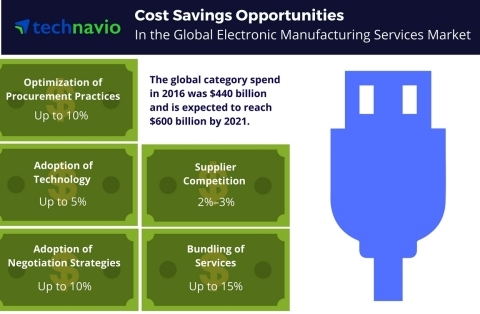 According to the latest procurement intelligence report from Technavio, the global electronic manufacturing services market is expected to grow at a CAGR of 6.4% over the next five years.